The British are coming! The quintessential British apparel brand Hunter has arrived in Japan’s capital, bringing the best elements of the countryside and its apparel to the heart of Tokyo. 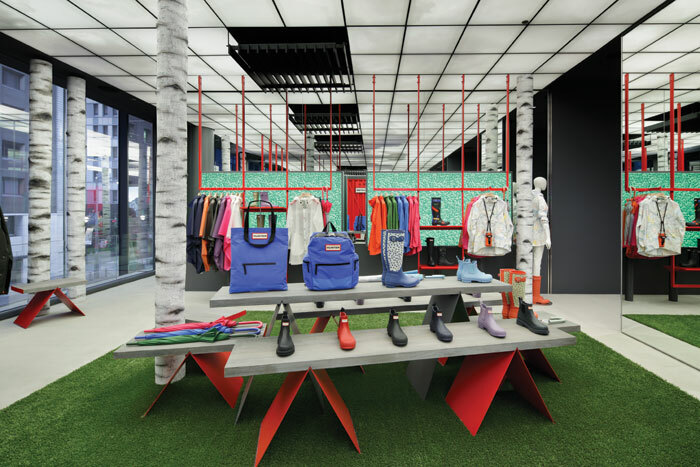 Global design agency Checkland Kindleysides has collaborated with Hunter outdoor wear creative director Alasdhair Willis to create the brand’s foremost retail experience in Japan. 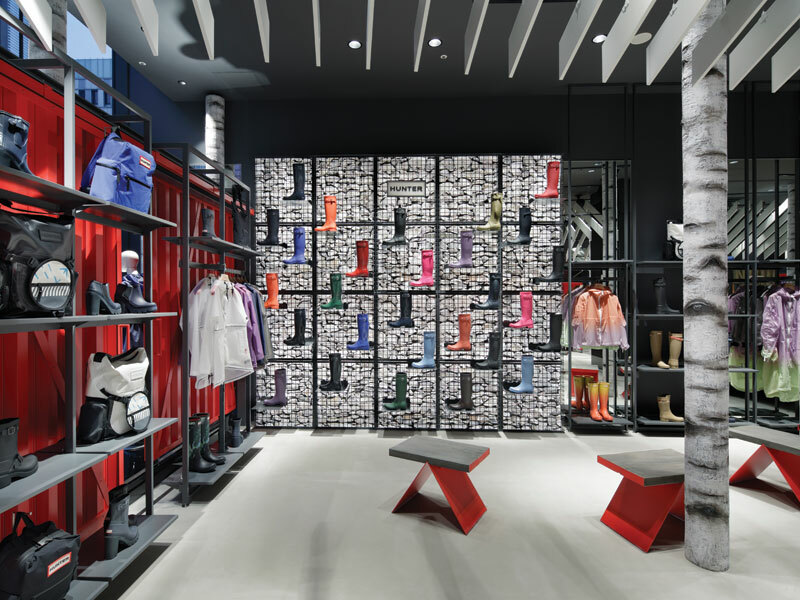 Located in the country’s capital city the flagship store houses an innovative and striking concept that targets a fashion-focused audience across its two levels as part of the prestigious new retail development in the Ginza district. 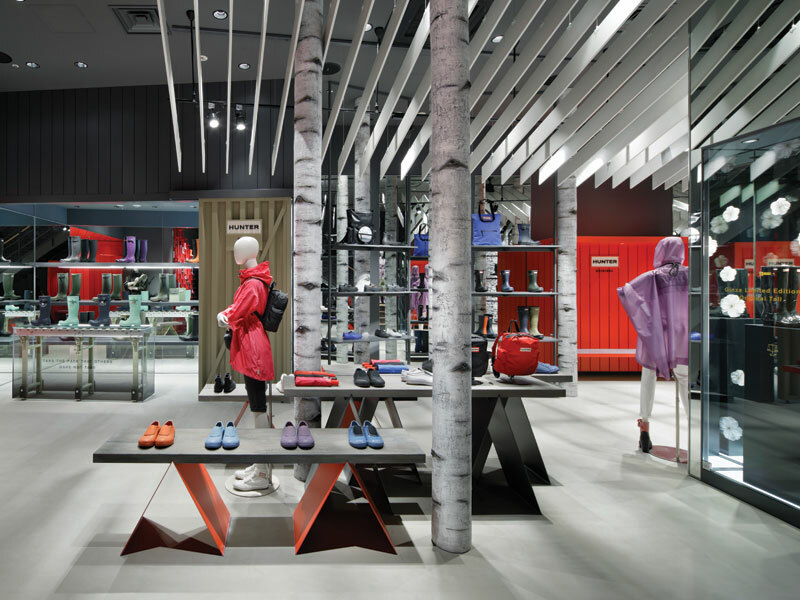 Delivering a dreamlike journey from countryside to city, starting in an imaginary forest, the interior takes the distinct British brand’s DNA and fuses it with the uber urban energy of Tokyo. 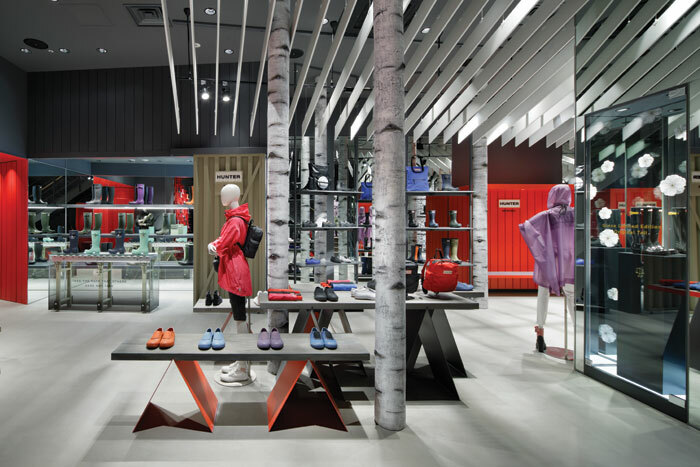 ‘The store is designed to amplify the Hunter experience to the Japanese market, creating a less literal and more ethereal version of the original concept with more potent and distilled brand signatures’, says Checkland Kindleysides’ creative director, Joe Evans. Visitors arrive in the ‘forest’ while being sheltered with barn roof-like structure. 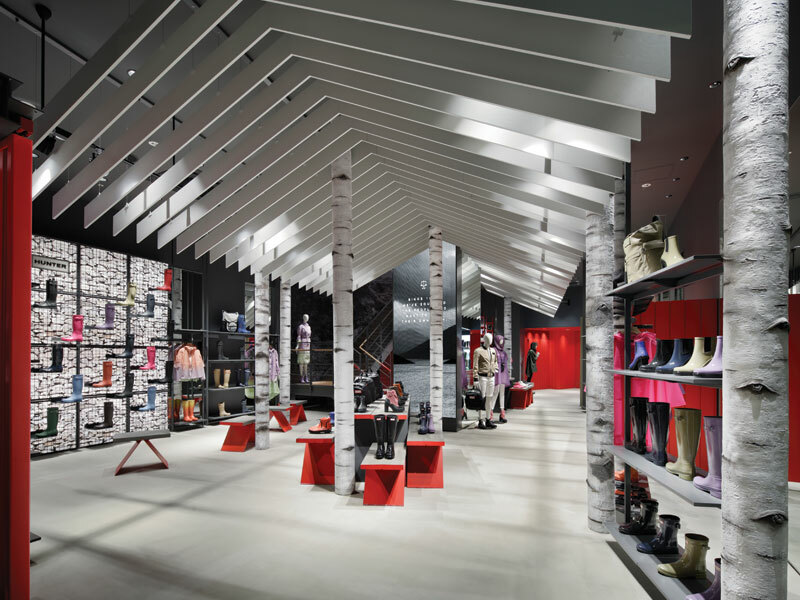 The ‘trees’ are hand-crafted replicas of silver birch that pass through the barn roof, piercing the ceiling into the first floor to reach an illuminated ‘sky’ – a 53 sq m gridded light box surrounded by mirrored walls. 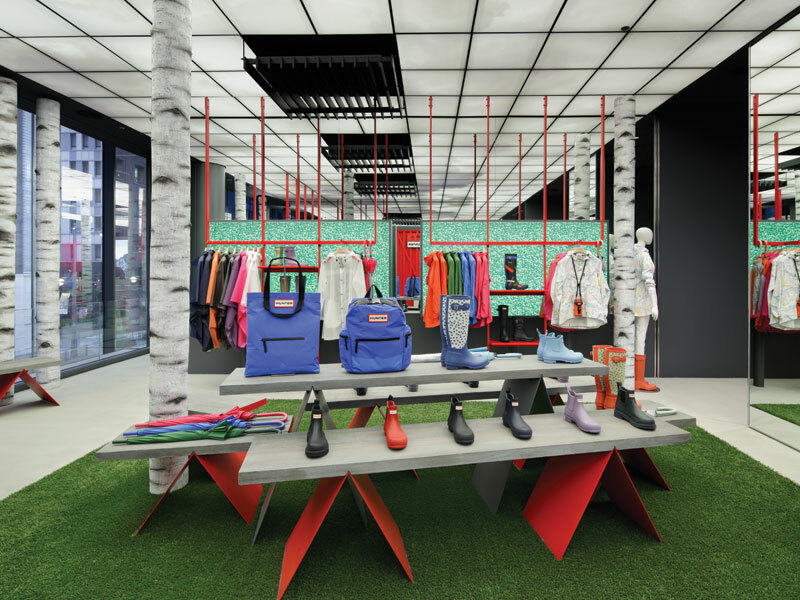 The journey continues on the first floor with a playful interpretation of a traditional English box-hedge garden where LED illuminated hedges and an artificial turf floor act as the backdrop to garments. 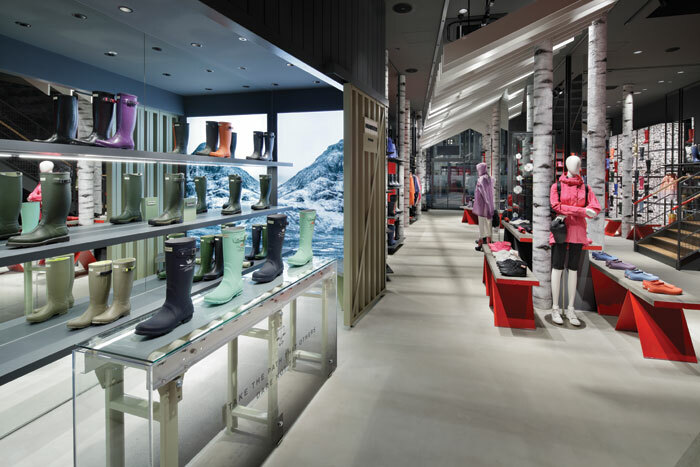 The store’s multisensorial experience is enhanced through a 4m-high digital screen showing Hunter campaigns, films and recent events, as well as live broadcasts from events around the world. 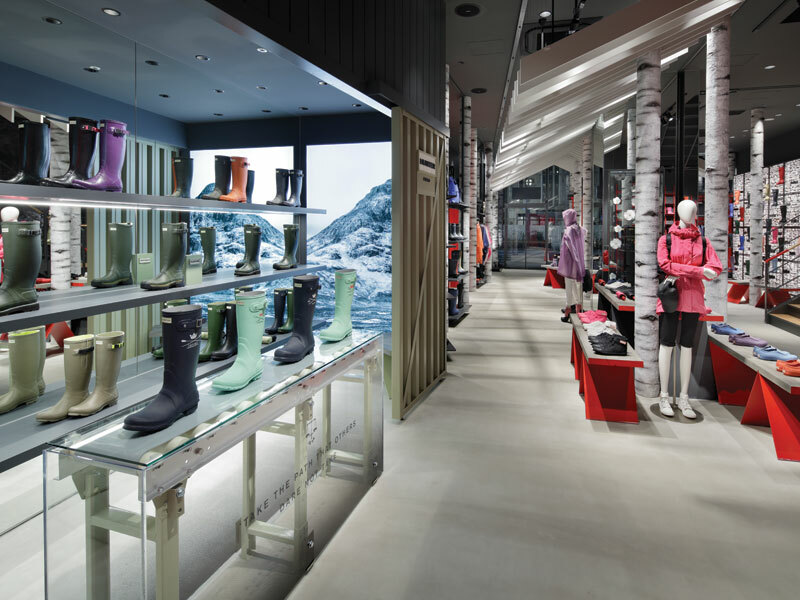 Referencing the often notorious British weather, the screen also displays regular weather updates from the UK, each time accompanied by a coordinating soundscape that echoes throughout the store. ‘Japan is one of the most important and exciting markets for Hunter’, explains Willis.